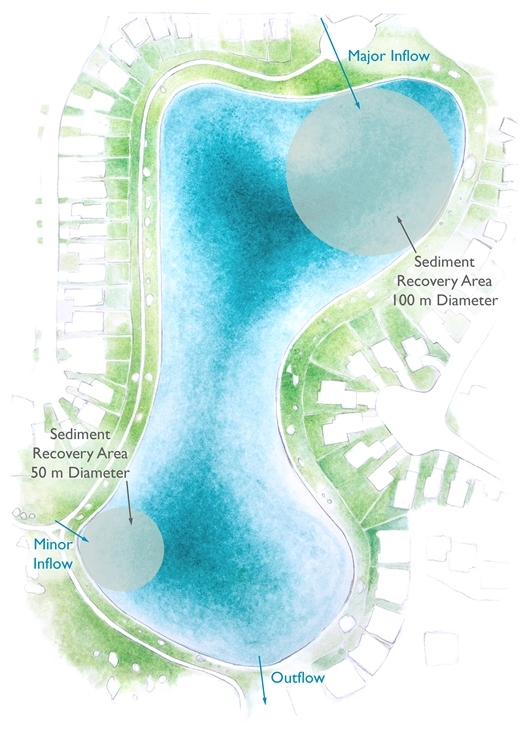 This case study analyzes Harvest Hills Pond in Calgary, AB. A typical stormwater pond has a 20-25 year maintenance cycle, which addresses sediment accumulation. Harvest Hills Pond is approximately 25 years old and, in 2010, it was characterized by localized sediment accumulation inside the pond, accompanied by near-plugging of the major inflow conduit. The stormwater pond is surrounded by residences and is an asset to the community. 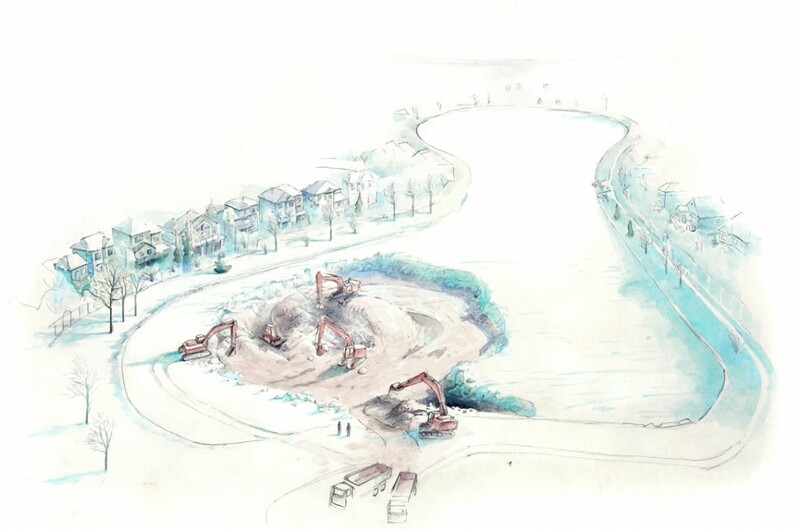 In 2010, sediment was removed from the Harvest Hills Pond using a conventional winter sediment removal approach. Dewatering of the pond stretched over a period of one month, and was followed by a removal of wet sediment using earth-moving machinery. The cost analysis of the overall procedure done by the City of Calgary had shown that the cumulative cost was 5 million dollars. Recognizing the recurrent issue of very high sediment management cost, Source2Source Inc. (S2S) took a proactive approach to re-imagining the entire design, maintenance and servicing process. In terms of design, S2S takes inspiration from the many decades of design philosophy development in wastewater treatment plants where the treatment process is discretely partitioned into multiple operating cells. 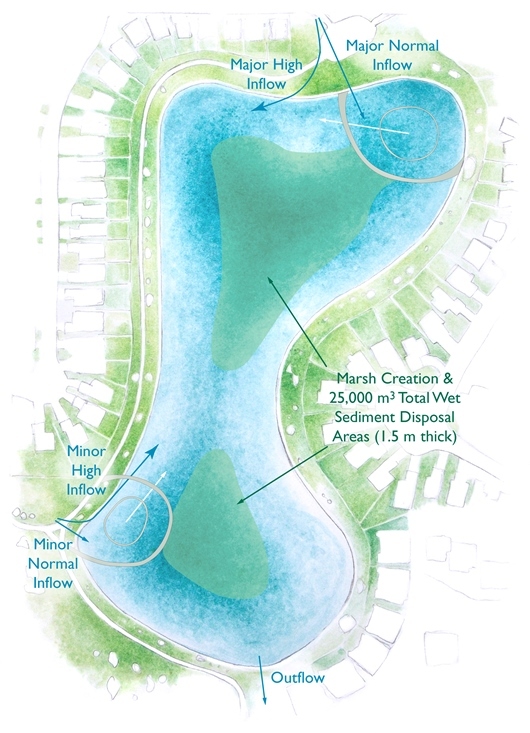 It makes sense to leverage the simplest and most important aspects of this successful design philosophy into stormwater systems by creating independent operating cells (some of which may incorporate Nautilus Pond™ technology) within the footprint of what would otherwise have been a lagoon style pond. One or more of these cells can even be designed as a future space for receiving sediment in a future maintenance operation where sediment accumulated in one part of the pond is relocated. Such a specialized cell could facilitate a multi-year dewatering and bioremediation of nominally contaminated sediment slurry. 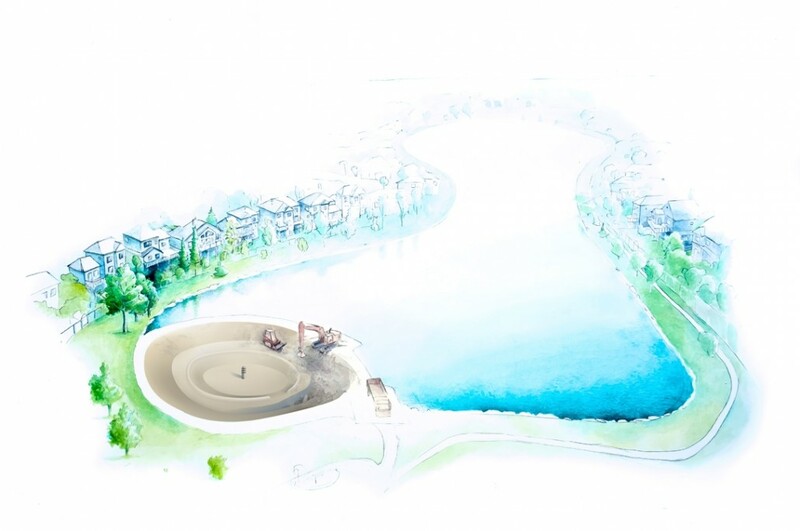 In terms of maintenance and servicing and knowing the cost and technical parameters for the Harvest Hills Pond, S2S has undertaken a servicing exercise specific to a hypothetical Harvest Hills Pond that was designed and constructed according to the multi-cellular design philosophy. Stormwater runoff passing through any Nautilus Pond™ cells would accumulate sediment near the perimeter where it is most accessible for executing a sediment removal operation. Separating each cell with a berm or causeway that supports maintenance vehicle access further simplifies sediment removal using traditional earth moving or specialized sediment removal equipment. The Stretch Dredge, developed by S2S, is an example of highly specialized sediment removal equipment that is well suited to management of slurries and other semi-solid media. The traditional approach to stormpond sediment management is to “remove and dispose” which typically utilizes a costly fleet of equipment and may involve trucking vast quantities of slurry containing mostly water. In contrast, our re-imagined design, maintenance and servicing process opportunity focuses on a “relocate and transform” philosophy that limits any future sediment removal and transportation efforts to transporting a relatively small volume of soil rather than large volumes of watery slurry.